There’s a funny thing that happens when you are a kind and friendly person and then mention something about being an Introvert. So when I sat down to write out the Behind The Scenes of my own client onboarding experience – the very steps and systems I use in my own business – it seemed fitting to dub it The Introvert’s Guide to Client Onboarding. Because, well, hi. Day 2: Are You Making It Easy To Get Paid? Before we dive in, please know that some of the links below may be affiliate links but also know that I’m only an affiliate if I really believe in something. Like really. But if you don’t wanna use them you can always just Google the product name and grab a fresh link. No hurt feelings! 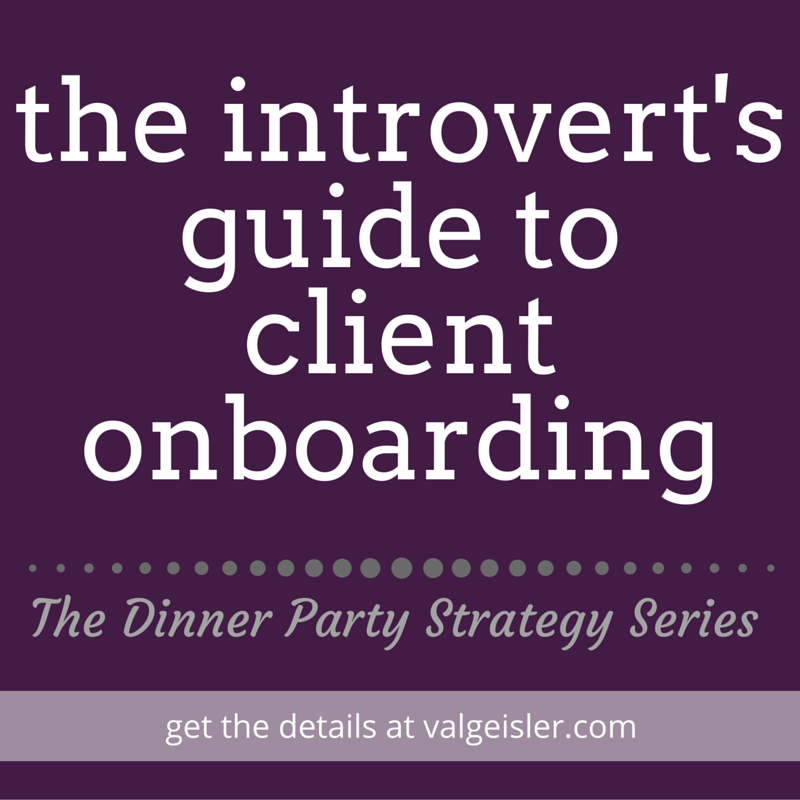 Attention #introverts: get THE guide to client onboarding! Acuity, Acuity, Acuity. I know I sound like a broken record over here but Acuity Scheduling is my everything. Recently, I tried scheduling a few appointments without Acuity and it was a disaster. Wrong time zone? Check. Double booked myself? Check. Back to back appointments with no time to even pee in between? Check. So I stick with Acuity. And you should too. When I’m contacted for 1×1 work, I’m occasionally asked for a 15 minute call to make sure we’re the right fit for each other. Happily, I send that prospect my scheduling link for a quick call. They pick a time that works for them, Acuity sends them a few preliminary questions, and then a reminder about the call with all the call in details. My inbox stays free and clear and they have everything they need. An introvert’s dream, really. I use Uberconference for my calls right now but it’s not been the most reliable lately so I’m exploring my options. If a client requests it, I’ll get on Skype but, ya know, introvert. So I prefer calls over Skype. Plus, I truly believe people are more open when they aren’t worried about how they look or making eye contact in that tiny camera. Again, Acuity Scheduling to the rescue. My 1×1 clients all book and pay with Acuity (Acuity conveniently allows them to connect with their Stripe or PayPal accounts) and it’s a one and done kinda thing. Less steps make an introvert very happy. Make client onboarding simple. Catch this behind the scenes to learn how. Which directs them to my Terms and Conditions page to check those babies out and agree. Client books first call, pays, and agrees to terms and conditions in Acuity. 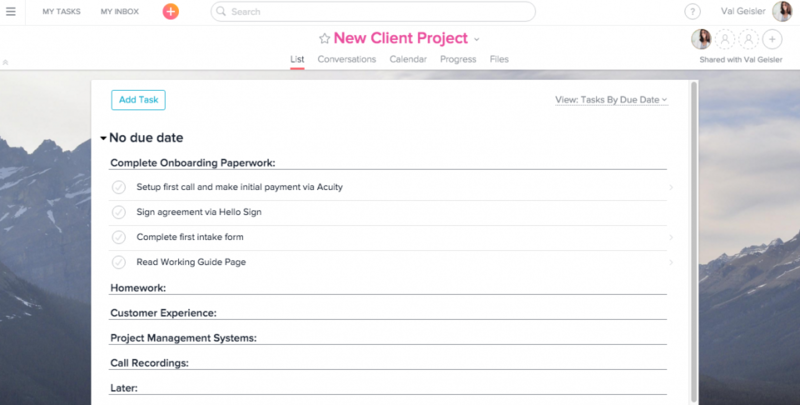 Acuity tells Zapier to setup a New Client project in Asana (courtesy of a template I have in place there). See that checklist? It’s all assigned to the client and they get to check off the tasks they’ve accomplished. That “Read Working Guide Page” links to the webpage where my Welcome Kit is housed. Easy peasy. And we’re off without a hitch! When all is said and done, we’ve had our final call and it’s time to part ways, my 1×1 clients get two things from me. 1) A request for testimonial and feedback all rolled into one. I link them up to a Typeform survey with my questions right there. It’s painless and I even include lots of multiple choice options so they don’t have to spend a lot of time on it. 2) A direct request for a referral. I typically ask them while we’re wrapping up that final call or I’ll follow up with an email a week or so later. Since I use Streak in my GMail inbox to keep track of everyone’s comings and goings, I just tag that client with a note to follow up on referrals a few weeks later and Streak hits me up when the time is right. If I’m being really honest with you (and I am), this is the hardest part. It’s an introvert’s nightmare to ask someone to tell you what they think of you AND to then ask them to tell other people that they should work with you. Ugh. But, ya know what? When I do it, it’s oh so awesome. Find yourself in feast or famine mode? Always wondering when the next client is going to come rolling in? Don’t skip this step! Testimonials and referrals are the key to happy and thriving businesses and sane business owners. Wanna know the key to a thriving biz and staying sane? It’s all here. If you cover all five parts of The Dinner Party Strategy in your own business, you’re sure to wow your clients, grow your business, and get all of the quiet time alone with your book you could ever dream of as you sit back, relax, and let the strategy go to work for you. Tell me in the comments below (it’s okay – go public! Let’s change the face of Introverted Business Owners right here and right now).